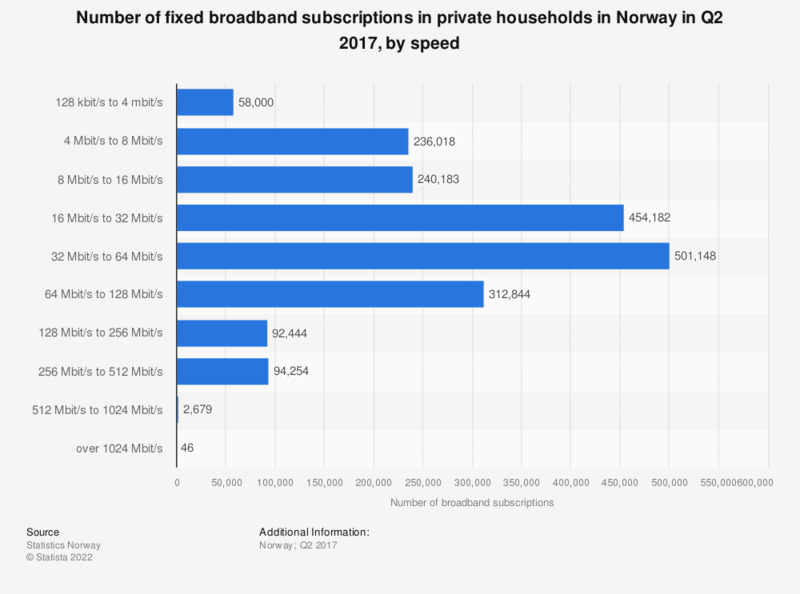 This statistic shows the number of fixed broadband internet subscriptions in private households in Norway in Q2 2017, by speed. The most common internet speed was between 16 and 32 Mbit/s with 454,182 subscriptions. During the same time period, broadband with over 1024 Mbit/s had 46 subscriptions. Data is collected directly from all enterprises that deliver fixed broadband access to end-users in the Norwegian mainland and Svalbard. Libraries, Internet cafés, businesses offering different types of temporary Internet-access etc. are not included in the figures. Suppliers of mobile broadband are not included in the survey.